You are currently browsing the daily archive for April 13, 2010. 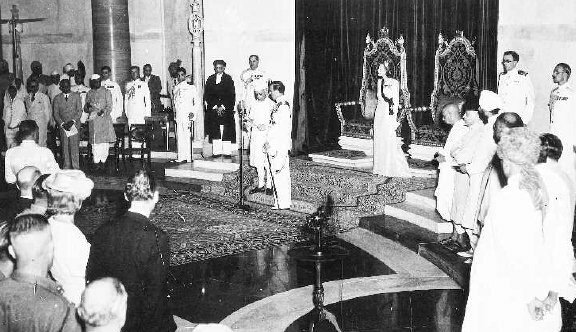 Midnight, August 14-15, 1947: Jawaharlal Nehru is sworn in by Lord Mountbatten as independent India's first Prime Minister. In ‘The Shadow of the Great Game: The Untold Story of India’s Partition’, Narendra Singh Sarila refers illuminatingly to the relationship between Nehru and Mountbatten when he writes ‘Nehru and the Mountbattens had come close to each other. The Indian was less able to separate affairs of state from personal feelings than the Englishman’. I was struck by those sentences, for they seemed to shed light too on what I have described as one of the most interesting features of British colonialism, as expressed by a couple of the great novelists who have dealt with the subject, namely the desire of the more interesting white protagonists to both dominate and be loved.